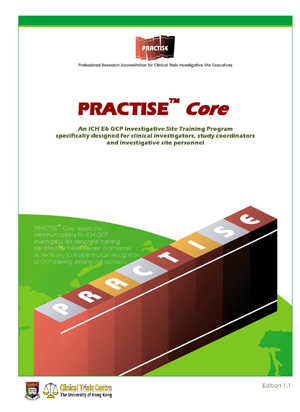 PRACTISE® Core is the essence of the PRACTISE® program covering the core areas that investigators and study site personnel must know about. The program is composed of eight out of the 25 modules of the full PRACTISE® program, adding up to a total of only five lecture hours. Thank you very much for your interest in PRACTISE®. Please spend a minute leaving your contact information in the following form, our staff should contact you where there is a PRACTISE® workshop. 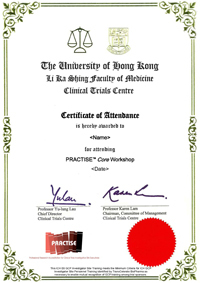 By submitting this form, you (i) express your interest in considering participation in the PRACTISE® Core workshop coordinated by HKU-CTC; (ii) agree HKU-CTC to keep, process and use your information for the purposes relating to your participation in the workshop; and (iii) agree HKU-CTC to contact you to participate in the workshop. Your information provided under this section will be protected under the Personal Data (Privacy) Ordinance (“Ordinance”). Your information will be kept on a confidential basis by HKU-CTC, will be used only for the aforesaid purposes, and will not be disclosed to any third party without your prior consent. Under the Ordinance, you have the right to request access to and/or correction of your personal data. Any request should be made to HKU-CTC’s Personal Data Protection Coordinator (Email: pdpcctc@hku.hk; Tel: 2255 2550). If you have any question about your rights under the Ordinance, you may contact the Office of the Privacy Commissioner for Personal Data of Hong Kong. We have received your enquiry about PRACTISE®. Our staff should contact you shortly for a follow up.